EVEN THOUGH THE equivalent of nearly half the Irish population visits Primark.com each week, the fast-fashion giant is going to keep shunning online retail. George Weston, the CEO of Associated British Foods (ABF) – which owns the cut-price clothing and homewares chain that trades as Penneys in Ireland – said there has been “no change of intention” when it comes to rolling out an e-commerce service. Five years ago, Primark trialled a web service with online-only player Asos but shut down the offering because shipping costs were too high. Since then, it has operated a website that showcases products but doesn’t provide online shopping. Retail pundits have previously suggested that the costs associated with fulfilling online orders remain a turn-off for the retailer, which has built its fortune on selling large volumes of low-priced products. The company’s long-standing director of its Irish operations, Breege O’Donoghue, confirmed the strategy after stepping down from her role, saying that e-commerce suited retailers with high-spending customers. Presenting the company’s results to investors and analysts, Weston said the group is “demonstrating quite nicely” that a mixture of attractive pricing and product ranges are enough to drive footfall at its 360 bricks-and-mortar outlets across Europe, the UK and the US. The retailer has also experimented with providing in-store ‘experiences’ like nail bars and salons to push traffic. Weston said that Primark-Penneys – which grew sales by £400 million to £7.4 billion (€8.5 billion) during its most recent financial year - “continues to attract ever-greater numbers of shoppers to our stores”. In its results for the year ended 15 September 2018, ABF noted that Primark-Penneys has generated a “loyal fashion following” through its social media channels, which have collectively earned 13 million followers, up from 10 million the year before. 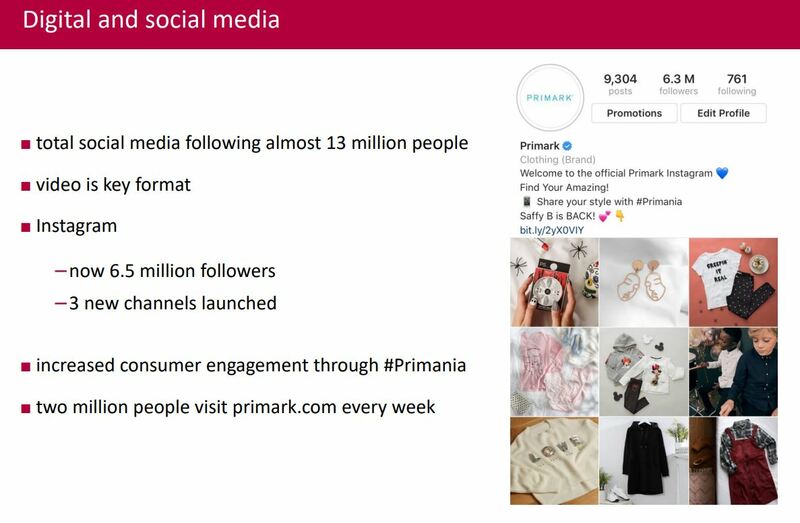 “Primark’s social media channels aim to inspire, and enable its followers to keep up-to-date on all the latest products, create wish lists, receive styling advice, and upload outfit posts to Primania,” Weston wrote in ABF’s accounts, referring to the retailer’s in-house social media platform. He told analysts and investors that the company plans to repeat partnerships with so-called social medial ‘influencers’ to drive sales of women’s clothing, pyjamas and skincare ranges. During the year, Penneys didn’t open any new outlets in the Republic of Ireland, although it slightly increased the combined floor space across its 37 stores to just over one million sq ft.
Weston told investors that Primark-Penneys is focused on opening more shops in mainland Europe to offset any shortage of available retail space in the UK, its main market. The comment suggests that it’s unlikely new shops will be opening in Ireland any time soon. In the directors’ report accompanying ABF’s results, Weston said that in the next financial year, the retailer will add another one million sq ft of selling space. “Germany, France, Spain and the UK will see the most space added and overall, we will add a net 15 new stores,” he said. Weston said that Primark will enter the Slovenian market in 2019 with a shop in Llubjana, bringing to 12 the total number of countries it operates in. “We are planning to enter a number of other markets in central and eastern Europe over the coming years and have signed the least for our first store in Poland, Warsaw,” he said. Primark-Penneys has long been the jewel in the ABF’s crown, which also owns and operates businesses that sell sugar, farming products, bakery ingredients and various hot beverages, cereal and balsamic vinegar brands. During the most recent financial period, the retailer contributed £7.4 billion to ABF’s £15.6 billion total revenue. Primark-Penneys’ profits increased 13% to £843 million (€965 million), ahead of stockbroker Davy’s forecast of £822 million.